Peter Crouch has dismissed criticism that his arrival has turned Liverpool into a long-ball team. Manchester United fans taunted Liverpool and the £7m buy from Southampton with chants of "Wimbledon" during Sunday's 0-0 draw at Anfield. 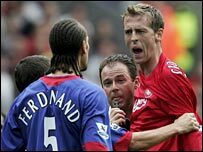 But Crouch said: "The United fans are always going to take the mickey, but we know we don't play like that. "When you've got Steven Gerrard and Xabi Alonso, who are great ball players, we can play a good style." The giant striker added: "We know we can mix it up too, and sometimes you need to hit a long ball and feed off the seconds. "I take a lot of the stick as a compliment. I wasn't going to let Rio Ferdinand have an easy time. When you play against world class players like that you want to unsettle them and that's my job done. I thought I did that well. "Maybe we were a touch deep at times. It worked well against Betis but not so well yesterday in the final third. But the result in Betis shows there's no problem. There's enough quality to get goals."